We are sharing children’s art books for March’s #littlelitbookseries. It’s 1892, and Charlotte is keeping a journal of her year-long trip to Giverny, where her artist father is learning Impressionism, an emerging style of painting. Charlotte falls in love with France, manages to learn some new words in French, makes new friends, learns how to garden and is excited to attend Monet’s daughter’s wedding! (Now, if this isn’t the ideal way to spend a year, I don’t know what it is. Sign me up.) The book includes reproductions of many Impressionist works, insightful historical background and short biographies of some painters of the era. 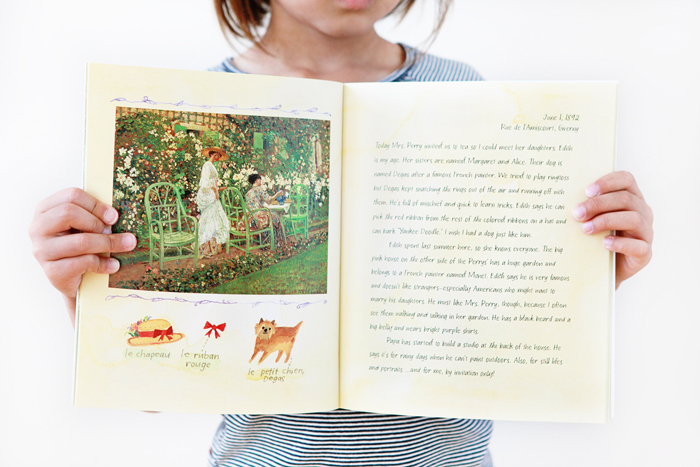 Charlotte in Giverny was written by Joan MacPhail Knight and illustrated by Melissa Sweet. In their series, Charlotte also travels to New York, London and Paris and learns about the various art movements in those cities. This series is a wonderful introduction to art history and the culture surrounding it. Be inspired by everyone else’s artful picks in the #littlelitbookseries on Instagram.